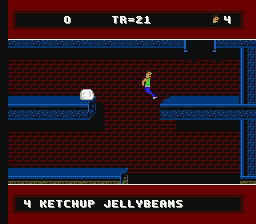 NES David Crane's A Boy and His Blob: Trouble on Blobolonia (USA) in 03:37.0 by TheAxeMan. This is an often-overlooked famous game. Here we have a boy and a "blob" that likes all kinds of candies. When the blob eats these candies, it transforms into different tools the boy can use. Note: The Japanese version of this game (Fushigina Blobby - Blobania no Kiki) has a different boy than this USA version, but otherwise the games are the same. Again this is a new record time. To quote hopper's comment: "Just when you thought this game couldn't get any weirder."